When this card inflicts battle damage to your opponent: Send the top card of their Deck to the Graveyard. 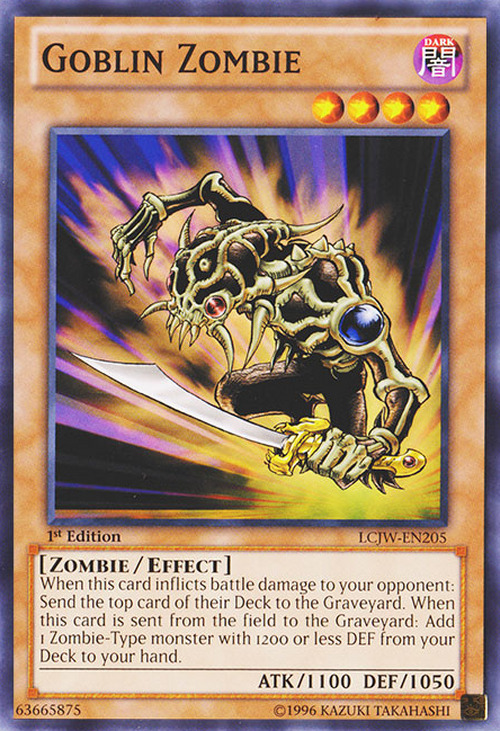 When this card is sent from the field to the Graveyard: Add 1 Zombie-Type monster with 1200 or less DEF from your Deck to your hand. This monster appears in the artwork of Zombie World. This monster's head bears the Eye of Anubis mark on it. This monster looks like similar to the soldiers of Zorc Necrophades. This card's OCG/TCG artwork is taken from , specifically from the panel where it is shown being Summoned. Mist Wurm: If you use a monster with a mandatory Trigger Effect like “Goblin Zombie” as a Synchro Material Monster for “Mist Wurm” you will activate both the effect of “Goblin Zombie” and the effect of “Mist Wurm” after the Synchro Summon is successful. P.M. Captor: When the Pendulum Effect of "P.M. Captor" resolves, even if the Pendulum Summoned Zombie-Type monster is in face-down Defense Position, the effect resolves as normal. 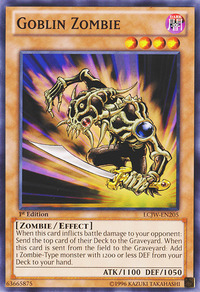 (If "Goblin Zombie" was Pendulum Summoned and flipped face-down by the effect of "Book of Moon", it is still affected by the Pendulum Effect "it cannot be destroyed by battle or card effects this turn". : If "Book of Moon" is activated in Chain to the activation of the Pendulum Effect of "P.M. Captor", how does it resolve?